(AA): Two terror attacks on Monday killed a prominent Muslim cleric and his 17 followers in northern Somalia and at least eight people were killed and wounded 15 others in Somali capital Mogadishu, police said. Ahmet Awale, of Galkayo police, said that two suicide bombers exploded in front of residence of the religious leader — which was also used as a Sufi shrine. and then four gunmen stormed the building and opened fire in the northern city of Galkayo. According to initial reports, 20 people were injured in the attack, Awale said, adding security forces killed three attackers n the shootout and one was captured alive. 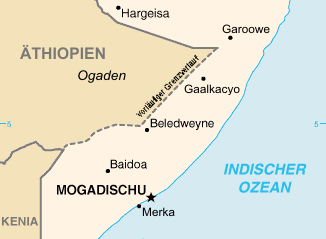 Terrorist group al-Shabaab claimed responsibility for the attack. Meanwhile in Mogadishu police told Anadolu Agency via telephone that the car bomb targeted a crowded marketplace in Kawo Godey in Wadajir, Mogadishu. No group has yet claimed responsibility for the attack but Somali officials blamed al-Shabaab for the attack. Hassan Gulled, a police officer in Mogadishu, told Anadolu Agency via phone that the car bomb targeted a crowded marketplace in Kawo Godey area in Wadajir neighborhood. “What we know so far about the attack is that at least 8 people, mostly civilians, died and 15 others wounded — who were rushed to Madina hospital for treatment,” Gulled said. Aamin Ambulance Service in Mogadishu also confirmed that they transferred more than 15 wounded people to hospitals. No group has yet claimed responsibility for the attack but officials blamed al-Shabaab for the attack.